Iceland is divided into the "Highlands" and the rest. Most roads in the highlands are only suitable for 4x4s and are only open in June, July and August. For the rest of the year they are closed due to snow. 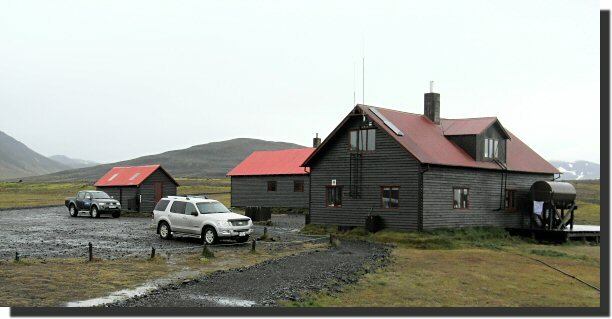 One of the advantages of bringing a 4x4 campervan to Iceland is that you can explore the highlands. According to Lonely Planet "To Icelanders the name Sprengisandur conjures up images of outlaws, ghosts and long sheep drives across the barren wastes. The Sprengisandur Route (F26) is the longest north - south trail and crosses bleak desert moors that can induce a shudder even today in a 4WD" . To me the F26 is a chance to enjoy some really desolate countryside and get away from most other tourists. If you want to, you can "do" the F26 in a day's hard driving. I decided to take my time and spend a couple of nights in the highlands. I started in the south (on the 30 and 32) and drove north. Although the F26 is reasonably rough in places, and there is no fuel for about 250km, it is very clearly signed and navigation is no problem. Sometimes there are more signs than are really needed. This "P" (the only one I saw on the F26 at N64.47500 W18.61944) is just a flat area of black volcanic ash you might like to pull off on. Or you could park 100 metres later. At Nyidalur (N64.73617 W18.07374) there is a "hut" with a helpful warden, but little else. When I was there there were only three other people, and no tents. The steady rain added to the splendid desolate atmosphere. 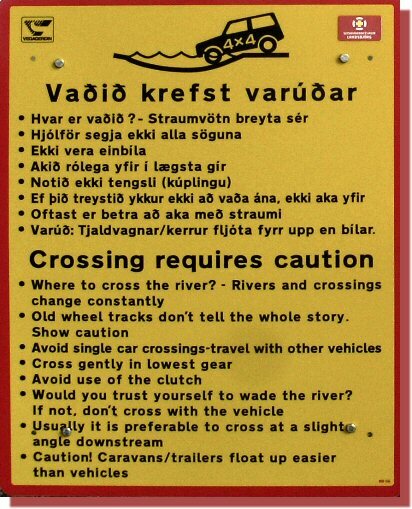 Although there are several un-bridged rivers to cross, none of them were any problem when I was there. 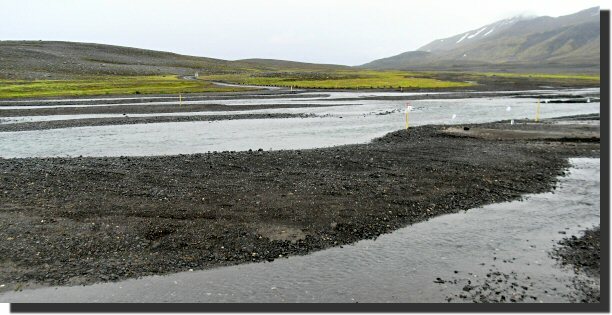 Most of the landscape is black volcanic gravel or sand, with the occasional dash of fluorescent green moss, and the odd glacier in the distance. Sometimes there are no distractions. The road surface is generally firm with some sections corrugated. Mist adds to the atmosphere. As you near the northern end of the F26 you pass the very photogenic Aldeyjarfoss waterfall. 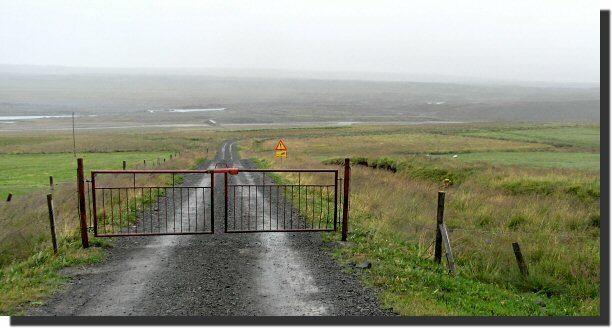 Then a final gate and you are at the end of the Sprengisandur Route , and back on proper roads. 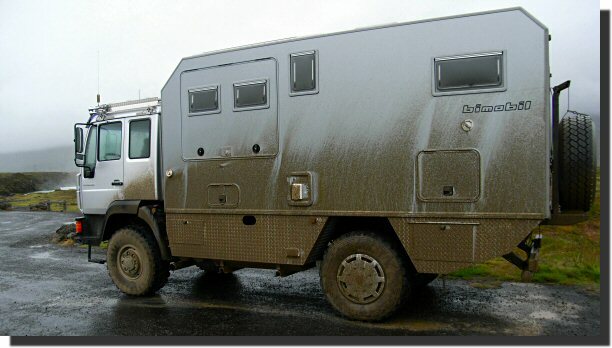 The next (easy) task is to find a fuel station to wash the grime off Man . Home - This page last changed on 2009-08-27.